A bicycle chain has more moving parts in it that the rest of the bike put together. The chain comprises of many parts including the inner and outer plates, rollers, and pins (or rivets) which effectively hold the chain together. For a chain to work, it must be flexible enough to run smoothly around any chainring and cassette combination. A smooth running chain will not only last longer, it will also perform better giving you less problems when you're out riding. All chains wear out through use, however the life of a chain can be greatly extended through a little bit of preventative care. 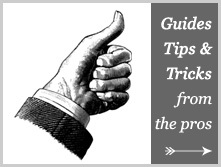 Chains need to be cleaned and lubricated regularly to reduce friction, corrosion, and rust. Specifically designed bicycle chain lubricants provide a 'boundary lubrication' that reduce friction between the moving parts of the chain. By looking after your chain, you are effectively putting money in the bank, because all the other the parts of your bike such as chainrings and the cassette will last longer. 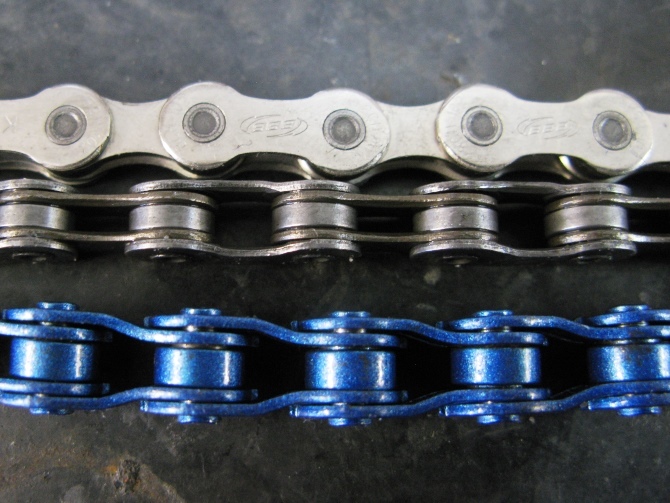 There are many approaches to chain cleaning and lubrication including removing the chain and washing it with solvents -- some are more complex than others! To make life easy, BikeWise mechanic Ollie Cashman recommends a simple no fuss method to clean and lubricate your chain. 1. 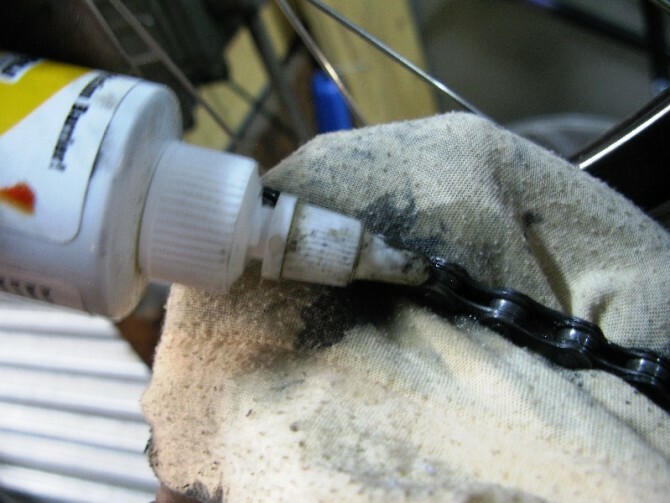 Using an old rag, rotate the cranks backwards and wipe off any gunk that is stuck to your chain. Make sure you clean the jockey wheels on the rear derailleur too. 2. 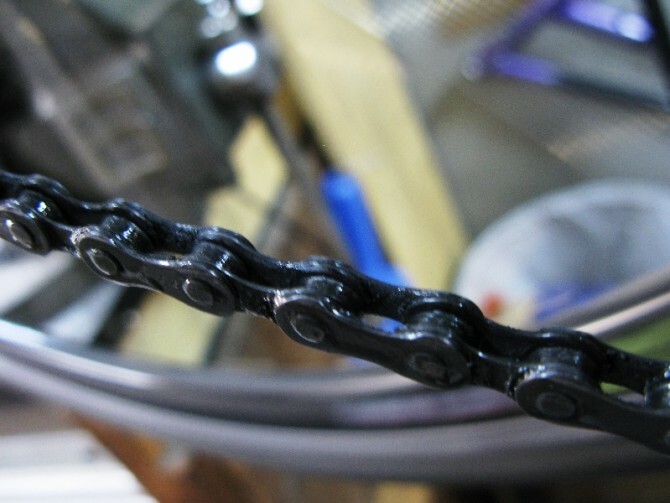 Apply a drop of bike specific chain lubricate (such as ProLink) to each link of the chain. Remember it’s only the rollers that need to be lubricated. The outer plates should remain as clean as possible. 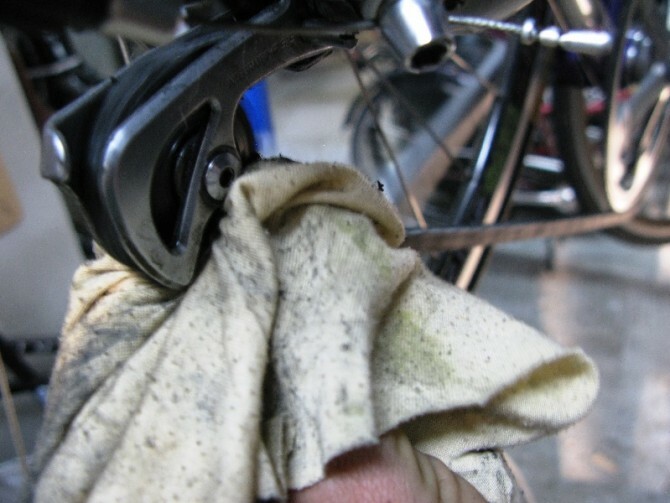 To prevent lube from dripping onto any other part of the bike, hold a rag underneath the chain as you apply it. If you are riding in the rain regularly, you may want to apply a ‘wet’ lube that will last longer in wet conditions. 3. Rotate the cranks backwards to allow to the lube to work its way into the chain. 4. Finally, wipe the chain and jockey wheels clean with a rag to remove all the excess lubricate. 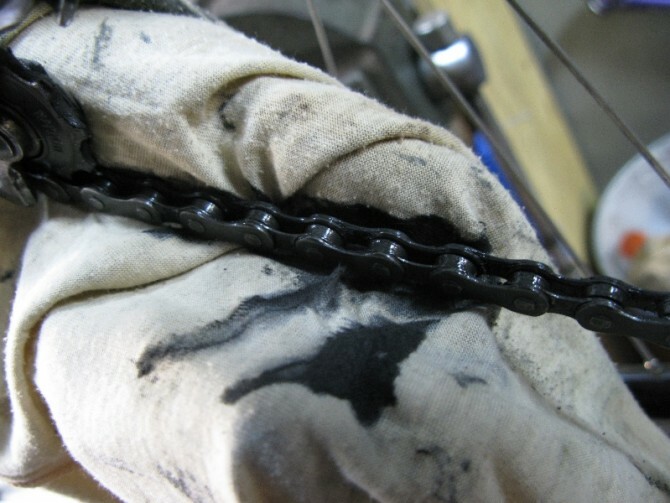 After lubrication, the chain should be as dry as possible to prevent dirt and grit sticking to the chain. The key issue with chain lubrication is to add a little bit often and wipe away any excess lube. There are many other methods for chain maintenance , but be warned ‘this is sometimes considered a "religious" matter in the bicycle community’! (see Sheldon Brown). 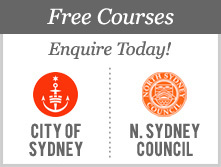 To get a hands on lesson in cleaning your chain, you can also register to attend a City of Sydney Bike Care and Maintenance course that runs four times a week.